Nominate committee leaders, directors now! Despite our shivering, spring and TPCH elections are coming! Our Continuum of Care (CoC) elects committee and subcommittee chairs and vice chairs each April and approximately half of TPCH Board of Directors members each May. If you’re willing to lead – or wish to name someone who is, here’s what happens and how to participate. TPCH’s Governance Charter requires that committees – and subcommittees – elect each April a chair and vice chair for the next July 1-June 30 year. These officers serve one-year terms. Each may serve two (2) consecutive terms, and then must wait out a year before again leading the same committee. • Elect chairs and vice chairs in April. • Announce at the May TPCH General Council Annual Meeting who will be your committee’s leaders beginning July 1, 2019. TPCH Board members are elected at the May TPCH General Council Annual Meeting. This year it is on May 9, 3-4:30 pm, in the Sabino-Rillito Rooms of the Emily Nottingham (Sentinel) Building, 320 N. Commerce Park Loop. TPCH last year did not specify term expiration dates when it increased Board positions. Therefore, TPCH’s Governance and Planning (G&P) Committee is perfecting a system to stagger term expiration dates. Meanwhile, any TPCH member may nominate potential directors by submitting the candidate’s name to the Treasurer and the Governance & Planning Committee chair by March 31 each year. 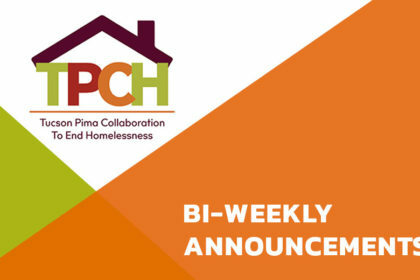 TODAY: Governance & Planning Committee –8:30-10 am, Sullivan Jackson Employment Center, 400 E. 26th St.
Board of Directors – Tues., Feb. 26, 3:00-4:30pm, Pima County Housing Center, 801 W. Congress St. Performance Evaluation & Monitoring Committee – Wed., Feb. 27, 9:00-11:00am, Sullivan Jackson Employment Center, 400 E. 26th St. Coordinated Outreach Subcommittee – Thurs., Feb. 28, 9:30-10:30am, American Red Cross, 2916 E. Broadway Blvd. Governance & Planning Committee – Fri., March 1, 8:30-10 am, Sullivan Jackson Employment Center, 400 E. 26th St. Homeless Youth Subcommittee – Fri., March 1, 8:30-10:00am, GAP Ministries, 2861 N. Flowing Wells Rd. Emergency Solutions Subcommittee – Wed., March 6, 10:30am-12:00pm, Library, Trinity Presbyterian Church, 400 E. University Blvd. 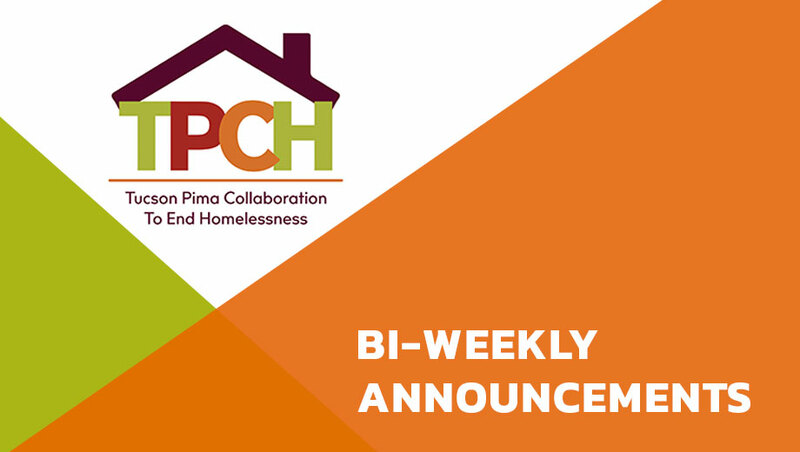 Coordinated Entry Committee – Thurs., March 7, 1:30-3:00pm, Pima County Housing Center, 801 W. Congress St. Nomination and election are not to satisfy ambition, but to serve. Please make your check payable to TPCH.